I’ve been involved in internet marketing for a few years. I’ve also built a few Twitter accounts to thousands of followers for marketing products. I had heard about content curation and wanted to see how it works as a marketing tool using my site www.Curatecontent.com. I started the site last year and have begun to monetize it with affiliate marketing of content curation tools on the site. My plan is to continue working on the site and grow its traffic. How do you use content curation on your site? The site is almost all curated content, with only a few original posts, mostly from early on. I have four categories of information on the site: Content Curation, Curation Tools, Curation for Education and Content Curation News. I manually curate the first 3 categories with my own comments on the articles I post. The Content Curation News category is automatically posting the good articles found by MyCurator. I review this category regularly, mainly to remove duplicate posts. This was a big problem early on but has gotten much better. All of the categories automatically post to my Twitter account @curationbuzz when new articles are posted. That account has around 770 followers. Have you seen benefits in Google Rankings and/or community engagement from content curation? I follow a few keywords and their ranking on Google. My site shows up as #1 on the keyword curate content. 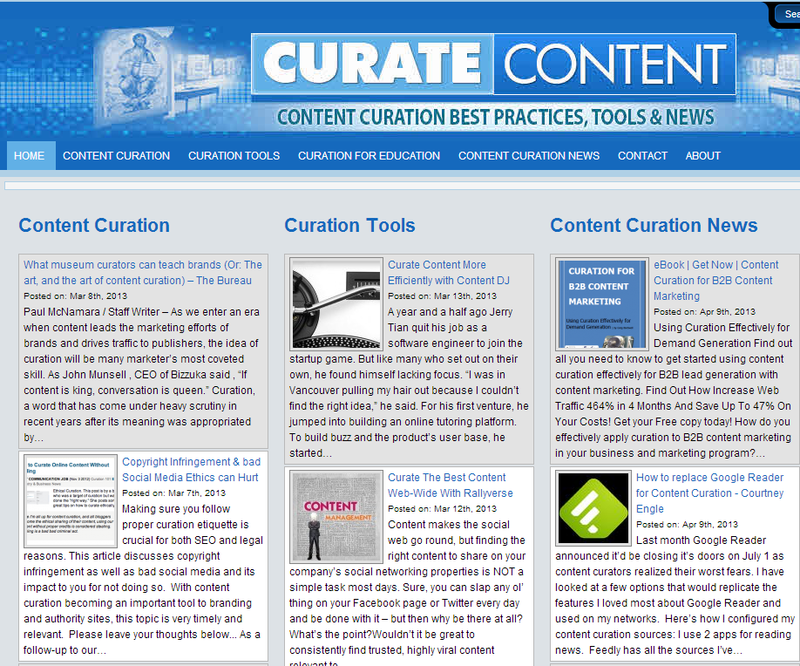 For content curation its currently #20, content curation tools is #26, content curation software is #19, MyCurator is #9. I’m also getting around 1,000 hits per month, with maybe a quarter coming in as direct traffic from my Twitter feed. Do you think curation has made it easier to write your own content? Yes, because the curated content gets you thinking, I find I spend more time writing content and opinions. What feature of MyCurator do you like the best? MyCurator motivates me to curate. I get a list o f really good content and I can go through it quickly and decide which ones I want to do something with. I really only look at the ones that are classified as good which saves a huge amount of time. MyCurator is a proactive tool that brings you content rather than waiting for you to search for content first.